King Charles II: What’s Not to Like? Holly West > Blog > Writing > King Charles II: What’s Not to Like? Posted on January 22, 2010 Categories Writing, Diary of Bedlam, 17th C Eng History13 Comments on King Charles II: What’s Not to Like? I suppose part of my liking for Charles II is based on childish romanticism. My first knowledge of him came from Forever Amber, which was a fictionalized and quite idealistic view of him. But even knowing what I know now about his backstairs dealings with France and his tendency toward absolutism, I think of him more as a pragmatist than a tyrant (not that the word tyrant applies in the least) and the English parliament had a much stronger role in his reign than in those of previous monarchs so he resorted to secret deals to get what he wanted on more than one occasion. Charles was also deeply interested in science and learning and promoted it throughout his reign. His religious tolerance is of interest but to be honest I think it goes back to his pragmatism, not his morality. His own religion, if he had it, ran mostly toward Catholicism but even in that, not too strongly. He converted to Catholicism on his deathbed but I think he would have done it a lot earlier if he truly believed religion to be an integral part of life. It may have ultimately been a means of salvation, but certainly not something to adhere to day-to-day so he waited until the last minute to convert. He kind of had a live and let live attitude, though critics would probably call him wishy-washy. Finally, the restoration was a unique period in English history and I find the contrast between puritanism and the "merry" time that followed appealing. He was looked upon as a savior (from puritanism at least) of sorts by the English populace, and though he believed in the "Divine Right of Kings" and his rightful place on the throne, in the end, he was just a man who wanted to enjoy life and didn't mind so much if his subjects did too. I think an earlier conversion to Catholicism would have caused a parliamentary revolt. They barely could stomach the fact that his wife was Catholic. Also, he was a philanderer, and I know they all were but it still gnaws at me somehow. All and all I like him quite him too. He was a king of the people — for that period. He was involved in finding ways to end the Great Fire and later in plans to reconstruct London. And I also like his intellectual curiosity. Who the heck is “Em” you wonder. EmilieNiagara. I adore King Charles, he was more than what you say, he was the King who lived by this exact phrase “Above all else treat women with kindness” as taught by his life tutor. He was also known as the King who always tried to avoid bloodshed. Tall dark and incredibly handsome. A monarch like no other and they certainly don’t make them like that anymore! King Charles, always in my heart! Where are you getting your information from?! King Charles was NOT a catholic at heart, and religion DID matter to him, it was one of the most important topics in his mind always! It was of the up most importance that England ALWAYS be ruled by a protestant! He didn’t change to Catholic til on his deathbed because of promise to do so, which he kept putting off because it was against his real belief! My uncle, father and mother are ALL historians for a living and I have grown up surrounded by artefacts from King Charles II reign, including many of his hand signed letters! Thanks for your comments! It must’ve been interesting growing up with historians, amid such artifacts. I do disagree with your conclusion that Charles was not a Catholic at heart–not that I think he was, particularly, but you seem adamant about it and I think it’s up for some debate. Religion was one of the key issues of his reign, if not *the* key issue and it wouldn’t have been politically expedient of him to reveal his true feelings on the subject. I don’t see how you can disagree when you have no proper proof that you have seen with your own eyes! Yes King Charles accepted any religion as long as they were true, but he was a TRUE PROTESTANT and he TRUELY believed that all monarchs of England should be a protestant, it was his mother that wanted him to be a catholic and he was forced to accept catholic faith if he was to receive help financially! He was a very poor King at first and had no money, all the palace goods were stolen. I have seen declarations in his own writing and signature that expresses how important it is to have a protestant King, he was even unsure of accepting Catherine of Braganza due to her faith, although he accepted her for believing he was not sure if it was right for England to have a Catholic Queen. I do not believe it is up for debate at all, I have seen so many letters about his protestant faith, and his problems with the French and Rome catholic’s and the pressure he so hated. My mother specializes in the 1600’s and RESTORATION era. I have even touched a jewellry piece that the King himself gave to Catherine, it is worth over 2 million! 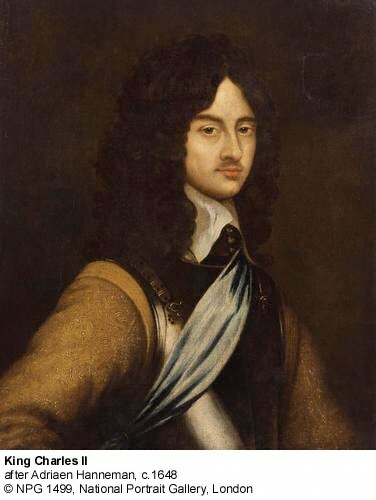 Below is a very nice picture of King Charles II, although the skin tone on most paintings out there is incorrect as Charles had dark olive complexion, his mother when he was born told everyone “I have given birth to an ugly black baby!” Very cruel I find. Charles was 6ft1 to 6ft 3, no one could reach the top of his head even on a small stool! He looked unusual for the time, but to the ladies when he was older he was considered very very handsome. Most artists of the time were ordered to “lighten” the paintings they did of Charles. Excellent comments and love the picture, Nell. Thanks for your input. 🙂 and sorry for being so adamant! I love King Charles too, Hence my online name. O then ’tis, O then that I think there’s no Hell Like loving too well. O then ’tis, O then that no joy’s above The pleasures of love. O then ’tis, O then that I think here’s no Hell Like loving too well. So full of true love to be jealous of me. O then ’tis, O then I think no joy’s aboveThe pleasure of love. No, it’s okay. I appreciate your insight/input, and I’m enjoying your comments. Thank you!